Type the router’s setup URL (http://192.168.0.1) into a web browser address bar. 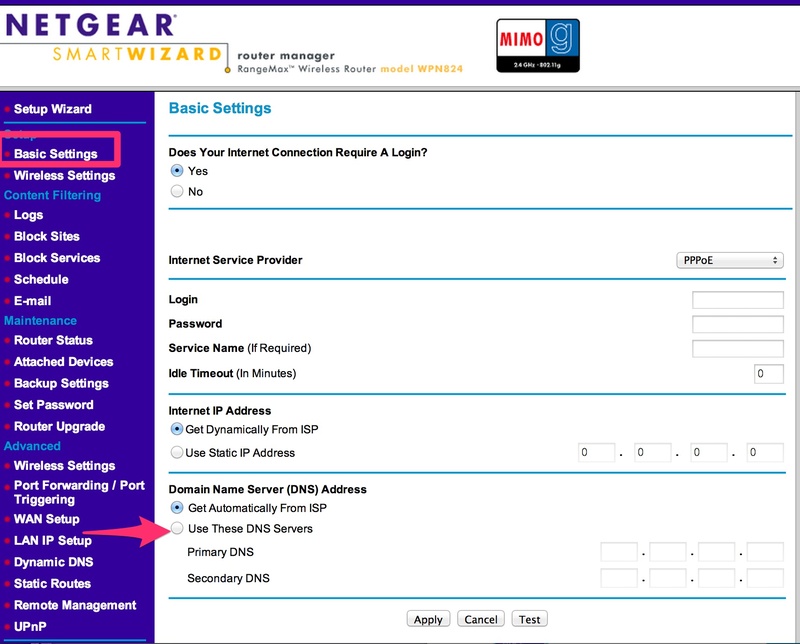 http://192.168.0.1 is the default Netgear router IP address. 3. Type in Kibosh Nameserver addresses in Primary DNS and Secondary DNS fields. If you do not see the following screen, click on Basic Settings. If the options are not present and your device is supplied by your Internet provider, the ability to set custom DNS servers may have been disabled. Please write down your current DNS settings (if any are set) before switching to Kibosh, in case you want to return to your old settings for any reason. Set the DNS addresses section settings to “Use These DNS Servers”. See your welcome email, or setup guide for Kibosh Nameservers. 5. Wait for the settings to be updated. After the settings have updated, we highly suggest that you reboot to clear local caches so the Kibosh Internet Filter will start working immediately.